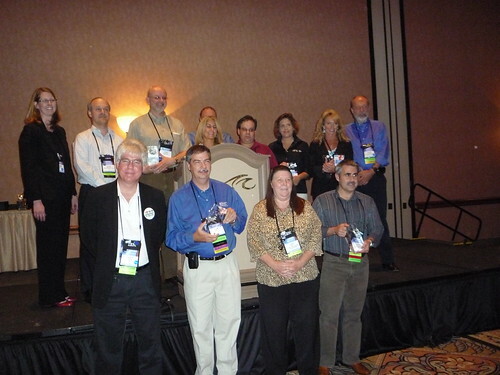 The IBM Data Champions in attendance at IOD were recognized for their hard work and dedication to the community during the Data Management reception last night. Amit has posted photos of the event and the champions on Flickr (Thanks, Amit), and as I mentioned in my last post, you'll hear more about the program during Arvind Krishna's keynote today. It looks like Amit wasn't the only one grabbing photos yesterday. What's that I see on Jerry Keesee's forehead (or more to the point, IDUG President Julian Stuhler's arm) (Thanks, JGP)? Spokey Wheeler: They really do have Informix tattooed across their foreheads! Spokey Wheeler: Are you a Data Champion? Also, if you're tweeting or blogging from IOD, make sure you add yourself to the lists here (blogging) and here (twitter), and if you're on site with and snapping pictures, don't forget to add them to the Flickr pool here. And keep those posts coming, everyone!